Wall of Hadrian By far the most famous defensive barrier in the Roman Empire; served for nearly 300 years as one of the major dividing lines between Roman Britain and the barbarians of Caledonia. With the exception of the Wall of Antonius, built just to the north, the Wall of Hadrian was unique in all of the imperial provinces. Emperor Hadrian ordered its construction in 122 C.E., and work was begun by Platorius Nepos, governor of Britain, who completed it around 126. The wall extended some 73 miles (80 Roman miles) from Wallsend (Segedunum) to Bowness-on-Solway (or the Solway Firth). It was intended not as a formidable bastion but as a base from which Rome’s presence could be maintained. Roman troops, mainly auxiliaries, manned its turrets and were to fight any large enemy force in the field while keeping watch on the frontier. In the event of a direct assault, the defenses were only adequate, perhaps explaining the collapse of Roman power in Britain from time to time. The original plans were probably drawn by Hadrian. The barrier was to extend some 70 miles and be made mostly of stone, 10 feet thick, while the rest would be constructed of turf, 20 feet thick. The turf wall was completed, but the stone sections had only just begun when the plan was extended several miles to ensure that the barrier covered the area from sea to sea. Further, the stone portions were to be only 8 feet thick, instead of 10, and approximately 20 feet in height; the turf portions, 13 feet high. Forts were distanced some 5 miles from each other, with so-called milecastles spread out every Roman mile, connected by watchtowers. Two ditches were dug. The one in front was approximately 30 feet wide and 15 feet deep, designed for defense and V-shaped. The ditch behind the wall has caused considerable archaeological debate. Called the Vallum (trench), it was straight and flat-bottomed, 20 feet wide, 10 feet deep, and 10 feet across at the bottom, fortified on both sides by earthen walls (but then filled in). Scholars have speculated that it was once used for some other, nonmilitary purpose. 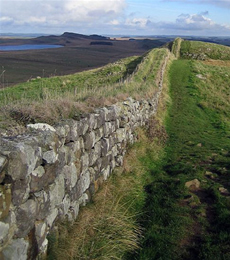 Until the construction of the Antonine Wall in 142, Hadrian’s Wall was the only frontier marker in Britain. With the Antonine Wall in the north, its importance decreased briefly until 180, when the Antonine Wall was destroyed. In 196–197, Clodius Albinus took with him every available soldier in Britain for his bid for the throne, thus allowing the wall to be ruined. Septimius Severus repaired it from 205 to 207. Peace was maintained until the late third century C.E., when the chaotic situation in Roman Britain following the deaths of the usurpers Carausius and Allectus brought the Picts down from Caledonia. Constantius I launched a restorative campaign but throughout the fourth century barbarian inroads put pressure upon the wall as Roman influence diminished. More invasions poured over the wall, only to be repulsed by Count Flavius Theodosius in 369. The last garrison on the wall withdrew around 400 as the barrier became a monument to Rome’s past.